The idea of me teaching someone how to cook a few years ago would’ve been pretty laughable. 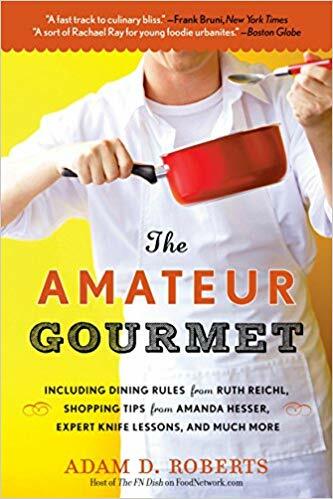 I am, after all, The Amateur Gourmet, not The Gourmet Who Knows Enough About Cooking To Teach Others How To Do It (try loading that into your browser). But, lately, I have to say, I’ve kind of hit my stride as a cook. 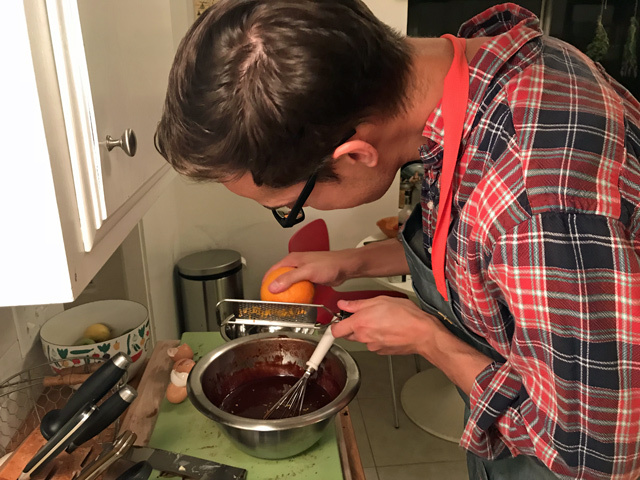 I’ve been doing this now for over a decade and I cook meals at home about ten times a week (including breakfasts, lunches, and dinners), and after spending so much time in the kitchen, I guess you do get to a point where you’re more of an authority than not-an-authority. 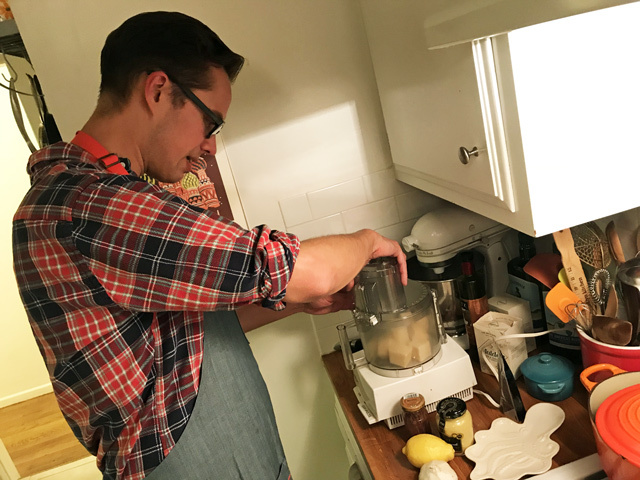 Which is why, when my friend Jonathan talked about wanting to learn how to cook, I said I’d be happy to teach him. I didn’t think he’d actually take me up on it. But then he did take me up on it and, this past Sunday, he was coming over at five PM to learn how to make some stuff. Suddenly I was cast in the role of cooking teacher. This was a lot of pressure! I calmed myself by choosing a menu I was super comfortable with, in fact it’s very close to the same menu I served Jonathan’s boyfriend Ryan for his birthday a few weeks earlier: Caesar Salad, Fusilli Alla Vodka (instead of the Spaghetti and Meatballs, too hard plus Jonathan’s a vegetarian), and Flourless Chocolate Cake. 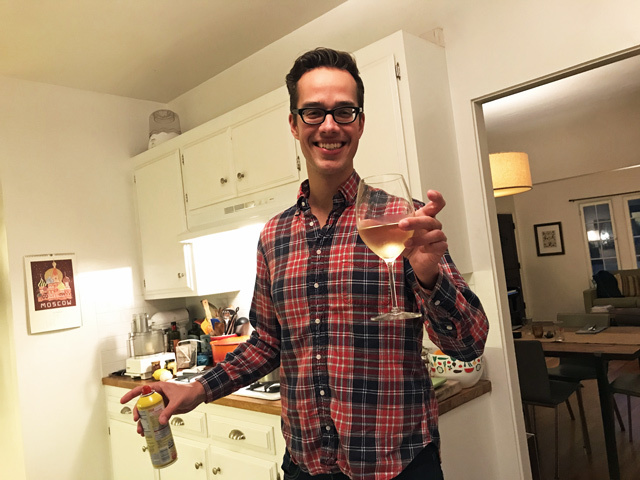 When Jonathan arrived, I immediately led him into the kitchen and told him the first step was to make the space his own so he should probably choose the music. He said Lady Gaga was fine (I was playing Joanne, which I very much enjoy these days). I told him the second step was to pour a glass of wine which he was happy to do. 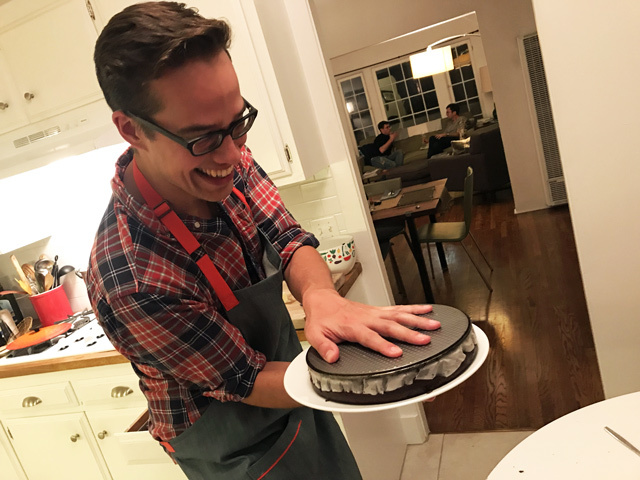 That’s actually an important step for anyone who hasn’t cooked before: you have to make it fun. If it feels like a chore, it will be a chore, and you’ll never want to do it again. 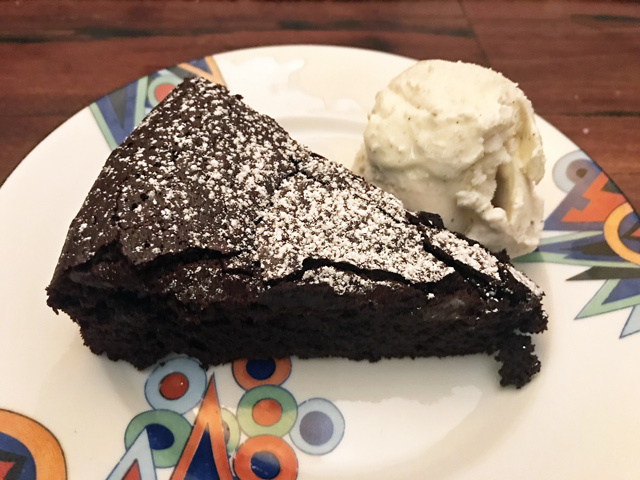 I chose this flourless chocolate cake (recipe here) because it’s a great beginner’s cake, with lots of bang for your buck. Plus there are lots of nifty techniques involved. The first of which involves lining the bottom of the pan with parchment paper. 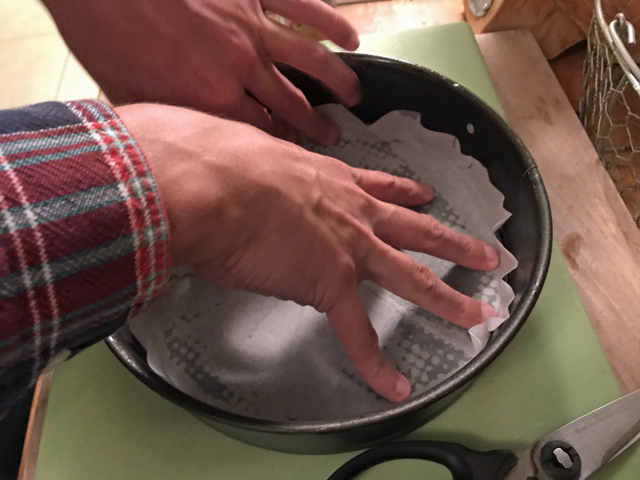 To do so, you fold a square of parchment in half on the diagonal, then do so again and again, until it’s pointy. Then you hover the point over the center of the pan, cut along the perimeter, and voila: a perfect circle. “Let’s do that!” said Jonathan eagerly. …and also a splash of Cointreau, to reinforce the orange flavor. Once the dishes were done (Jonathan cued up the next album, Whitney Houston Live), we moved on to the Caesar salad. One of my favorite tricks for a dinner party comes from The Barefoot Contessa. 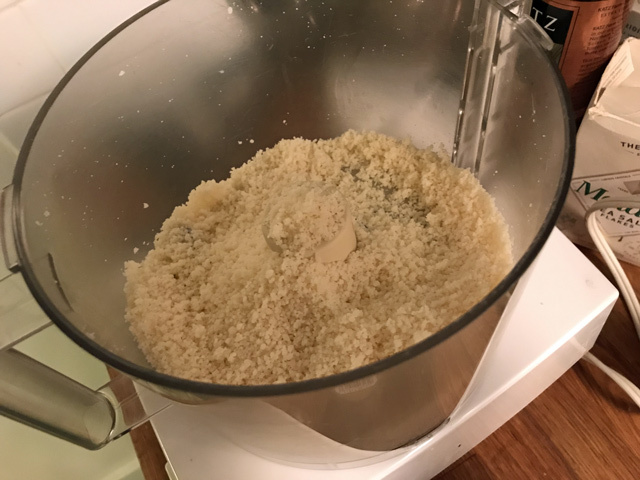 It involves putting really good Parmesan into the food processor. 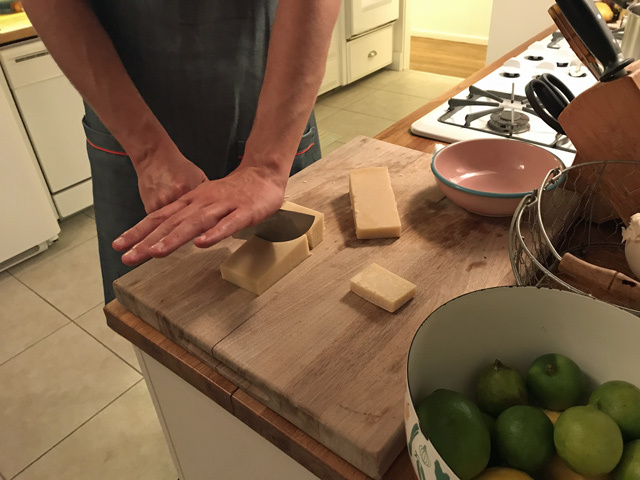 First, you cut the rinds off the Parmesan and then cut the Parmesan into cubes. …and then process until you have a relatively fine powder. Why is this such a good technique? 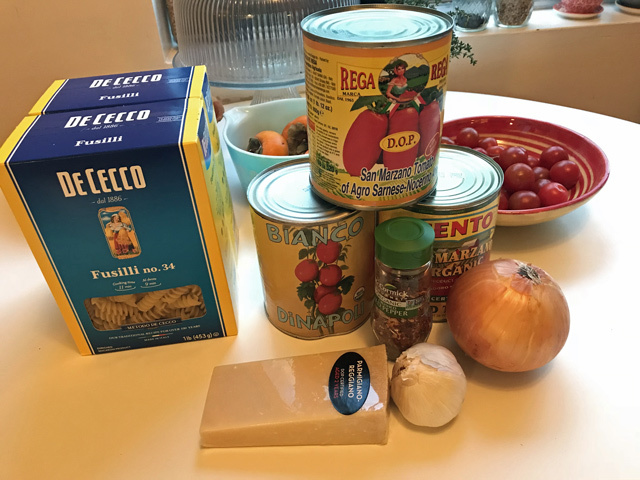 Because (1) You wind up with way more Parmesan than you’d wind up with if you grated the cheese by hand; which (2) encourages you to use more in your cooking, making your food taste better. 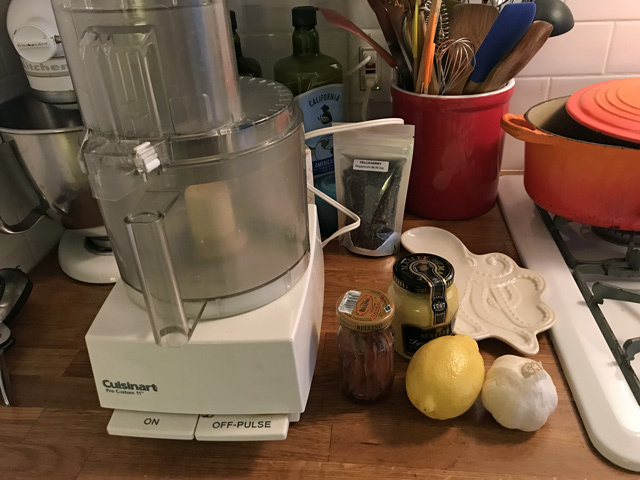 Plus, the residual Parmesan in the food processor helps thicken your Caesar dressing. Which is what we got to next. I had Jonathan peel several cloves of garlic by cutting off their ends and smashing them on the board. 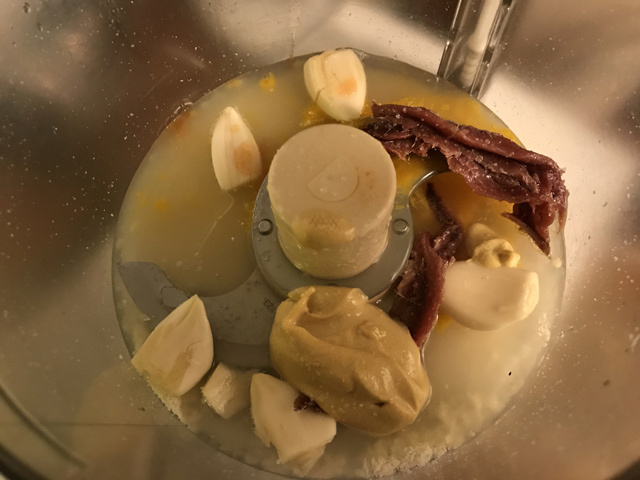 That went into the food processor along with an egg yolk (Jonathan wasn’t squeamish), anchovies (Jonathan was squeamish), mustard, lemon juice, and a pinch of salt. On went the machine and then I had Jonathan drizzle in lots of olive oil. After a good minute of this we stopped the engine and tasted. “Wow, this is so good!” said Jonathan. “You’re a natural,” I said, adjusting the dressing with some Parmesan. Then I told Jonathan he could play with the flavor if he wanted, we could add Worcestershire sauce or Tabasco. “Let’s do Tabasco,” said Jonathan. He added five dashes, mixed that in, tasted, and added a few more until he was happy. 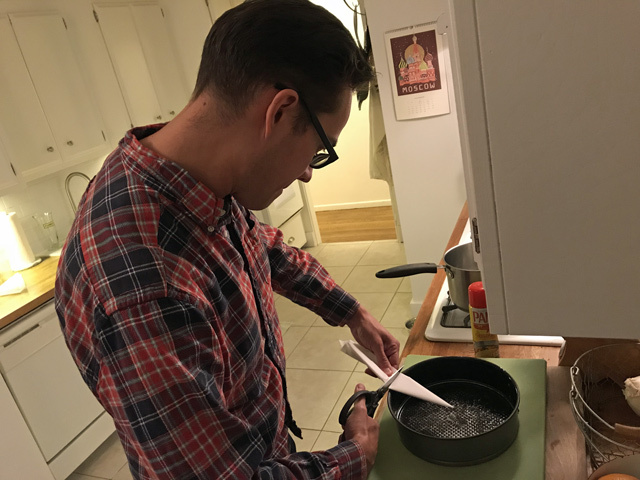 After spinning gem lettuce from the farmer’s market in a salad spinner, we set all of the salad stuff aside in the fridge, and got to work (after doing the dishes, new music: a radio station based on Etta James) on the pasta. First step, making the sauce. I was going to do a whole choose-your-own-adventure thing with the sauce, letting Jonathan choose the fat (olive oil? butter?) and the flavor profile (garlic? anchovies? red pepper flakes?) 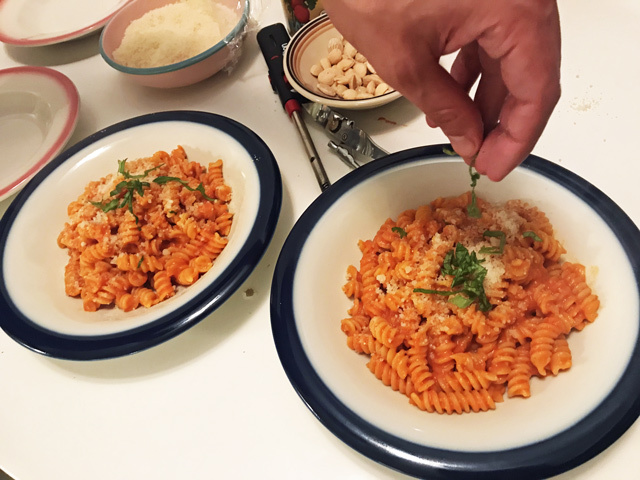 but then realized that playing with a vodka sauce would yield more exciting results, while still allowing Jonathan to make choices along the way. So, first up, the fat: we started with a mixture of butter and olive oil. 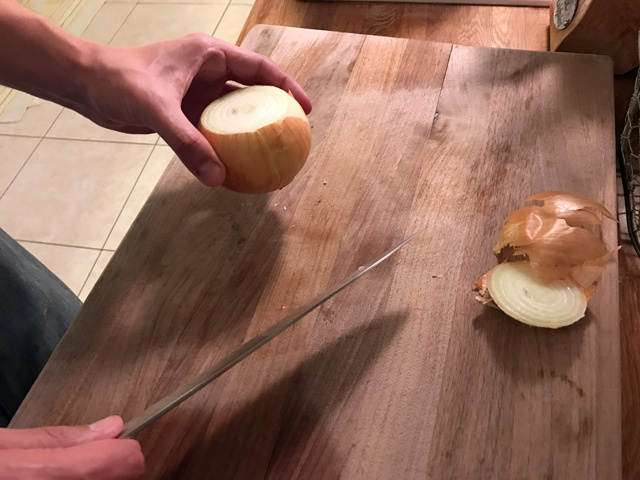 Then, the hardest thing of all: teaching Jonathan how to chop an onion. 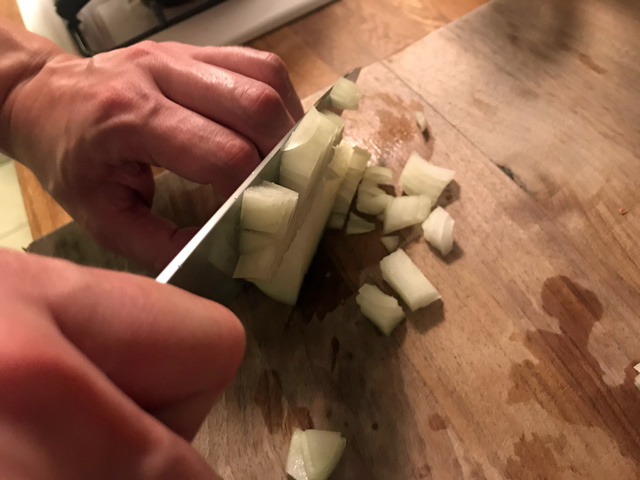 Chopping an onion is kind of THE essential cooking skill. It’s what Meryl Streep spent all that time doing playing Julia Child in Julie & Julia. 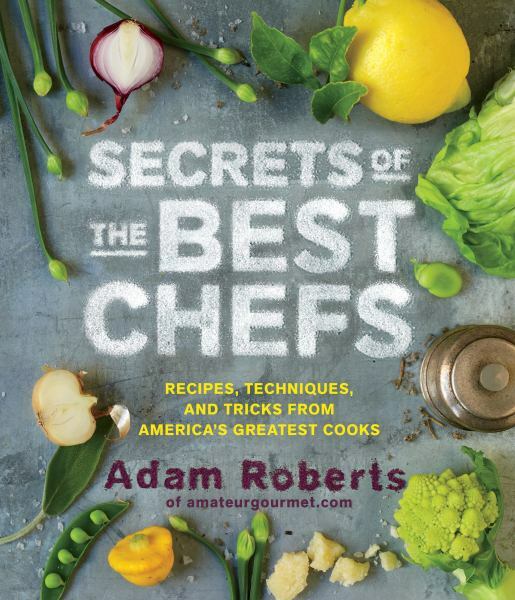 It’s something that you’re going to have to do a lot in the kitchen if you plan to become a cook. You can see him curling his fingers in the right way in that picture! So into the pot with the olive oil and butter the onion went, along with some sliced garlic, red pepper flakes, and tomato paste. Those all toasted, then we added two cans of tomatoes, and let them all cook together (along with a leftover Parmesan rind) while Ryan and Craig arrived and were ready for the first course. On to chilled plates went our Caesar salad, dressed in Jonathan’s Tabasco-laced dressing, and Jonathan proudly presented it at the table. Guess what? It was a hit. That Tabasco really added some zip. Plus, Jonathan had the idea to add some cherry tomatoes from the farmer’s market, which gave the salad some necessary color. Then back to the kitchen we went where, after tasting the sauce, we decided it needed more salt. 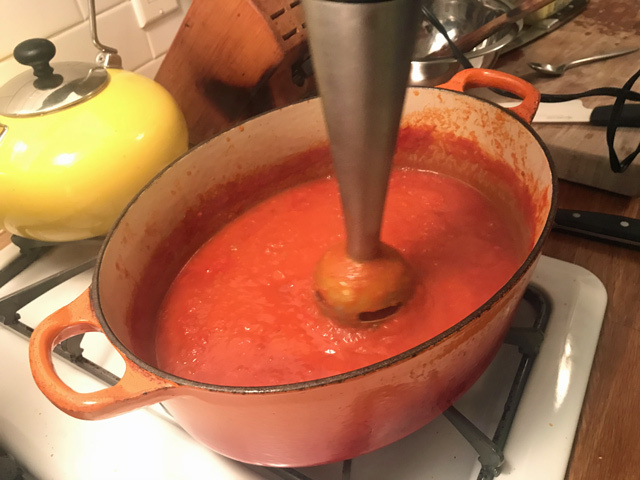 I also realized we forgot to add the vodka (this was vodka sauce, after all). Then I thought that the texture was too chunky, so we blended everything up with a hand blender. 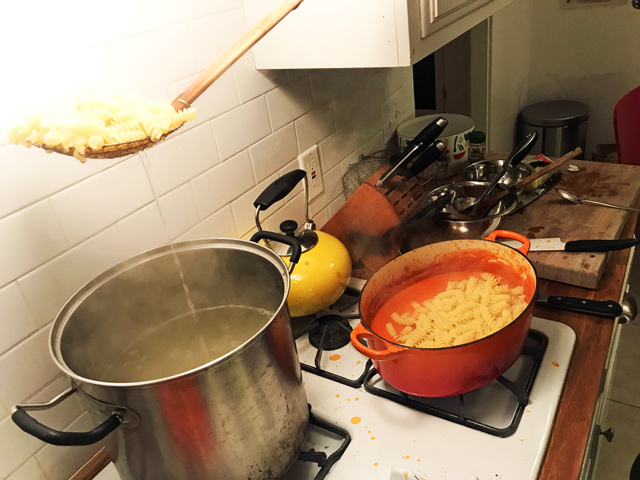 When the moment came, and the pasta was two minutes under the suggested cooking time, we added it to the pot with the sauce. We stirred that all together and I may have added some butter because, at this point, why not? Jonathan had the idea to add some basil, which was a nice touch. We also added a ton of that processor-grated Parmesan because we had so much of it (that’s the point!). Everyone agreed this was just as good as the spicy fusilli at Jon & Vinny’s which is high praise, indeed. 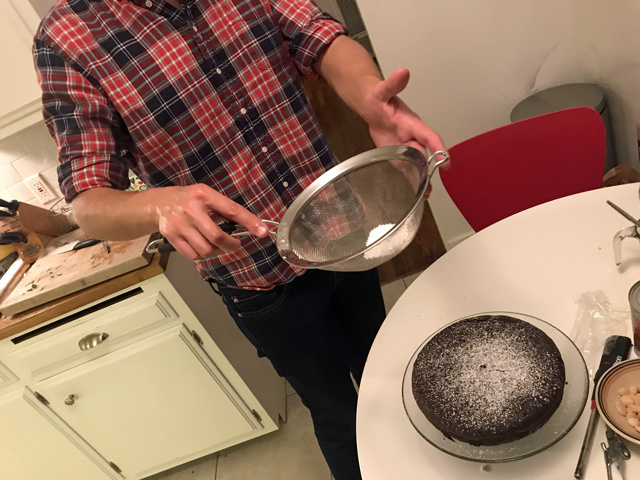 Finally, back to the kitchen we went, where Jonathan sifted powdered sugar over the cake. Then he sliced it up and served it with ice cream. 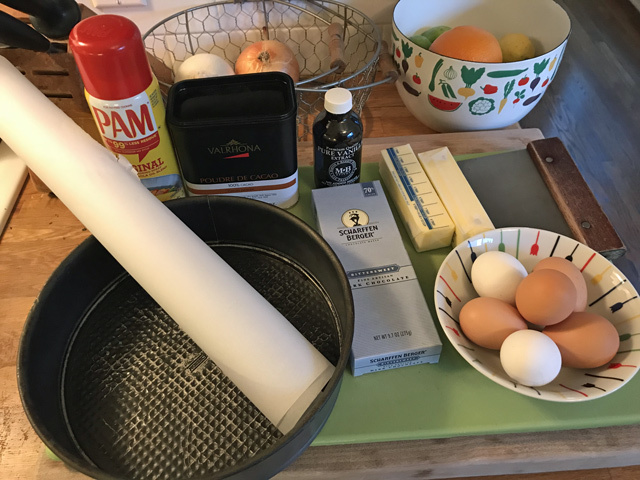 I believe it was Oscar Hammerstein who said, “By your pupils, you will be taught.” Well now I know to add orange zest the next time I make chocolate cake and to listen to Whitney Houston the next time I do the dishes. 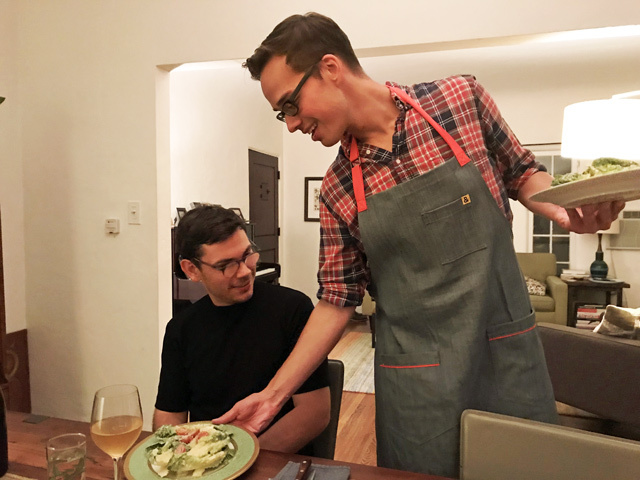 This was a super fun night and I hope Jonathan’s encouraged to keep cooking now that he’s been taught by an Amateur Pretending To Be A Pro. I told him a lentil soup would be a good next step so he can practice his knife-skills, seasoning skills, etc. Let’s just hope he doesn’t salt the lentils too early. Or too late. Come to think of it, I should probably be there….